As usual I have no clear recollection of where the idea for this puzzle came from. Possibly it was some mention of the expression ‘the one that got away’ that suggested this treatment of a fishy theme. The first step was to produce a list of possible grid entries from which a fish could be removed to leave a real word. Unfortunately this turned out to be fairly limited, given no duplication of fish. However, I ended up with a list of alternatives that looked quite promising, so the next stage was the grid. Ximenes in his Art of the Crossword covers this and makes it sound easy, but it isn’t — at least to me — so I usually try to tweak a grid I’ve used before, as was the case this time. Grid filling was relatively straightforward, then it was a question of cluing, which thematically had to be ‘the one that got away’, ie. a letter to be removed before solving. This is a doctoring method that I don’t find easy, but ever since the late lamented Radix commented (on someone else’s puzzle) that the cluing method should, whenever possible, relate to the theme I’ve tried to stick to it, as it seems eminently sensible and adds to the thematic element of the puzzle. Then to finding a suitable quotation to provide the user with a clue to the theme. I know it’s common to use a quote that’s considerably shorter than the number of clues and simply say ‘some clues contain an extra letter…’ but to me as a setter that’s unsatisfactory – it has to be all clues, or there needs to be some reason for the selection of doctored clues, or at least some balance or equality between different clue types. (I’d like to be clear that this is a rule I set for myself, I’m not expecting others to agree, and I know some solvers like the added fun of spotting the doctored clues). That left me with two possibilities, of which a shorter quote, leaving clues for short grid entries undoctored, was preferable. I had some slight wriggle room, as RAID, which I’d have preferred to clue as is, could also be thematic, as RA + ID if necessary – which it was. ODQ was unhelpful, so I resorted to Google and eventually came up with the one I used, which though unknown to me seemed to fit very nicely once I realised that I could omit the final word FISH and get away with it, thus reaching the required number of letters. That left the title, and it took some time to find one that didn’t immediately give the game away, such as ‘The one that got away’ which I’d been using. I was quite pleased to hit on Whoppers, the whopper being both the lie and the usual description of the elusive fish. First of all, thank you Nutmeg for a surprisingly hard, for me at least, puzzle. I think it’s largely down to not knowing how many letters the Answer is going to contain that always seems to slow me down, as I’ve mentioned here before. …being FORTE formed as FORT E. Simply add a fish (here TUNA) and FORTUNATE appears. The checked letters pointed strongly towards the Answer being RETS, as did the definition of ‘softens’ but for some reason it took me ages to recognise ‘Left’ as a reversal indicator, such that RETS was formed as STER(n). Add a fish (GAR) to form GARRETS. There were 12 such clues. All others each provided an extra letter, which in order spelt out: ARE FISHERMEN ALL LIARS OR DO ONLY LIARS (FISH)? (William Sherwood Fox). So FISH was not only missing from the phrase but also from the Answers and so needed adding to form the Entries. At least that’s how I read it! We always enjoy solving Nutmeg’s crosswords, so downloaded this one with a smile. 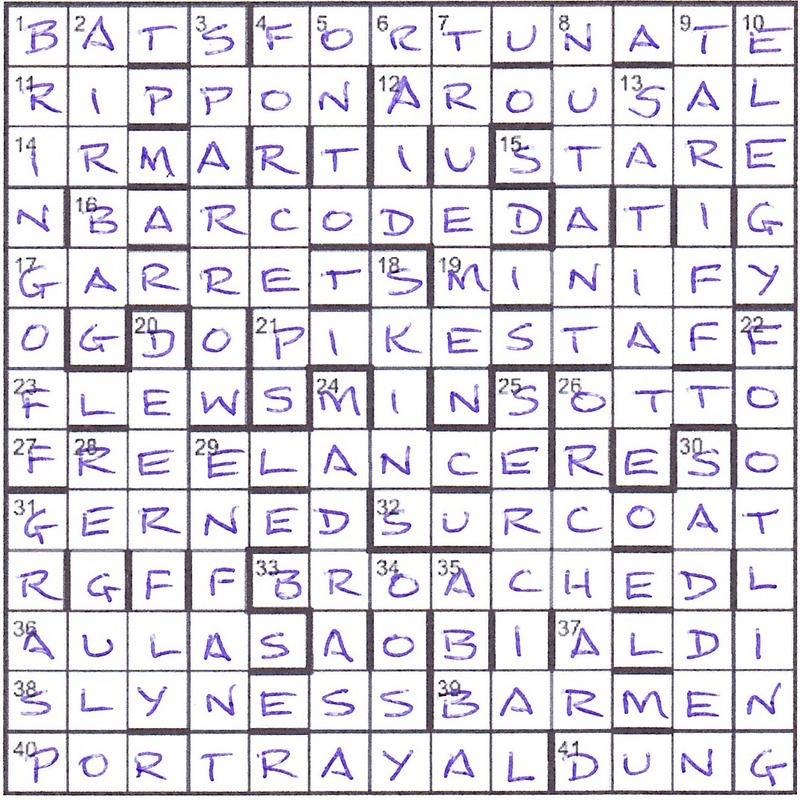 That smile became a little strained when we read that some answers had to have ‘something’ added before entry in the grid, and that the remaining clues contained an extra letter that had to be removed before solving. We mused for a while about what the whoppers were going to be and opted for the obvious LIARS, suspecting that we might be looking for something of Nutmeg’s style like her lovely ‘Twelve Days of Christmas’, or a puzzle where ‘the more Pooh looked the more Piglet wasn’t there’. There’s a Hilaire Belloc poem about Matilda who told lies and was finally burned but it isn’t ‘short’. Nothing to do but solve. Ah, yes, of course I had to confirm Nutmeg’s continued membership of the Elite Listener Setters’ Tippling set-up and of course she qualified with ‘Madeira’s base Catholic cu[l]ts in a row (7)’. The clue gave us SERCIAL (C in SERIAL) but we needed the Big Red Book to tell us that sercial is a Riesling-like grape used to make the driest Madeira. Barmen appeared later on when we had started filling our grid with fish and the clue ‘Troops initially withheld assent (6)’ gave us (A)MEN to which we added the BAR. Membership confirmed. Cheers, Nutmeg! Solving went very slowly at first. As always, we found the clues beautifully set and smiled at a few. ‘It might have been pure b[l]ack antelope on eland’s tail (4)’ gave us another word that needed the BRB to tell us that ‘pure’ could be DUNG, so a GNU was reversed on the tail of the elanD. Nice! We were beginning to make sense of the extra letters and had confirmed that the penultimate word of our short verse was LIARS when that lovely H coming out of ‘W[h]inged gave us FLEW (with a homophone for ‘flu’) and gave us enough letters to realize that FISHERMEN were our liars. ARE FISHERMEN ALL LIARS OR DO ONLY LIARS FISH? Now that we knew that FISH was the missing final word, our grid fill speeded up enormously. We understood why a clue that led to PORTAL was entered as PORTRAYAL and PIKESTAFF had to complete the clue that led to STAFF (Singular river workers = S TAFF). We almost worked backwards since CHAR, COD, ID and LING were sure to be there, and, of course, they were, together with TUNA in FORTUNATE, GAR in GARRETS, EEL in FREELANCE, PARR in SPARROW and ROACH in BROACHED. Great fun, thank you, Nutmeg! What on earth, or rather what at sea was a poor jumbled little HARE doing in all that watery stuff! Of course, he was there, but somewhat upset by all the fishy business, down in the right hand bottom corner. Nutmeg’s previous Listener had entries which started together but then diverged left and right… bifurcating, to you and me. Before that, we had some drawing and colouring in to represent Sherlock Holmes stories. I have never met Nutmeg, but she always manages to make life slightly difficult for me and her puzzles are never a quick solve. This week, we had to find out what needed adding to a number of answers before entry in the grid. Clues to the other entries had an extra letter that needed to be removed before solving, with them revealing a short verse extract. 14ac IRMA and 15 STARE went in fairly quickly, followed by BARED which needed three letters adding to make its 8-letter grid entry. Another half-dozen were then slotted in, culminating in SURCOAT at 32ac. The downs were just as tricky with all those extra letters. However, 26dn ORD intersected with the C of SURCOAT, and ORCHARD seemed the likely entry. It seemed likely that we were dealing with either tea, housemaids or fish. I dismissed the first two on the basis that the puzzle’s title would be Brewery or Knees-up. So fish it was, and confirmed when I got FORTE/FORTUNATE in the top row and PIKESTAFF across the middle. The affected entries were FORTUNATE, BARCODED, PIKESTAFF, FREELANCE, BROACHED, BARMEN, PORTRAYAL, SPARROW, ORCHARD, FOOTLING. All in all, a typically fun workout from Nutmeg, although I’d have preferred 37ac to be AUDI rather than ALDI! A few years ago, I was thinking about setting a Hallowe’en puzzle, and I suspect that Aramis’ excellent (and difficult!) Tetris puzzle (No 4297) was in the back of my mind. I came up with the idea of a tribute to The Cask of Amontillado in the form of a brick wall. I had not read the story in ages and could only remember the general plot. Upon revisiting the work, I was delighted to find that the main characters, Montresor and Fortunato, had the same number of letters in their names (symmetry!). The quotations immediately leapt out, as well, but I couldn’t get them to work, unless…. Once it occurred to me that removing NEMO could lead to an intersection of MONTRESOR and ME in the NW corner, the title became a no-brainer. I could also attach IN PACE REQUIESCAT to FORTUNATO in the SE corner, and the overall structure fell into place. I knew that I needed rows, as well as paths, to provide the solver with some sort of reliable foothold. I would note that, as in the story, the grid/wall is eleven rows high (mostly as a result of name lengths and luck, but for which I’ll take full credit as a stickler for detail). I reckoned that, in addition to the characters’ names, quotations and structure, including both the title and the author in some form would make for a thematically comprehensive puzzle. Setting EDGAR ALLAN POE across the centre of the grid was easy enough. The first serious obstacle was placing the title. I knew that I wanted it to run from NW to SE (there wasn’t enough room for it to work vertically, and I thought that any sort of horizontal placement would give away the game too quickly) – it was long, but not quite long enough to wind elegantly along a reasonably straight, diagonal line from corner to corner. Plus, there was the problem of finding a suitable point to cross Poe’s name. Further, anticipating that the grid fill would be meandering and a bit of a mess anyway, I didn’t want the title’s appearance to be too clumsy; it needed to have some sort of reasonable flow. Since, without bars, the construction was largely fluid at that point, I ultimately decided to end the title in cell 6 and work my way to the top from there. The idea of “working up” was important to me, to give the sense of building the wall like Montresor did, and I numbered and lettered the clues accordingly. Again, to avoid the appearance of a haphazard structure, I arranged the starting points for the “path” entries to be generally symmetrical around a central, vertical axis. One final point on structure: I initially had in mind that there would be a single, central brick to be filled in, to suggest Montresor’s final sealing of Fortunato’s fate. So, in the initial draft, E A POE would appear across the centre, absent the central P. My test-solver (to whom I am very grateful) suggested that I make better and fuller use of the grid and block out alternating letters of the entire name. I took his advice, of course, but, in doing so, my original web of interweaving words fell apart and I was left with a mostly vacant grid, with some thematic guideposts. Not having the strength to recompose the entire puzzle at that time, I put it aside for about a year. When I picked up the puzzle again, my test-solver’s sage advice had stuck with me – I should try to enhance the grid as much as I could, perhaps not as a prerequisite for a correct solution, but in case anyone might be paying attention. So, in keeping with the story, I decided to make Row A about the bones (CRANIA and SCAPULAE) scattered along the floor of the crypt. I also saw in ROMAN A CLEF an opportunity to attach a “manacle” to Fortunato (technically, he was chained around the waist, but the story had already been so cooperative with my design that I took a liberty). I next decided to be even more ambitious and include a number of thematic clues and answers. I started with a list of words that I considered essential (I wish I could have worked in “flambeaux” or “carnival”), and others occurred to me as I constructed the grid. Several of the answers are directly mentioned in or related to the story (ROQUELAURE (spelled “roquelaire” by Poe), RALE, LEAGUER (a type of cask, though not clued that way), MOTLEY, SMOTHERS, IMMURE and CRYPT) and others are thematically suggestive (CRIANT (motley), ICER (murderer), CRUET (a wine container), CELLA and NAOS (both inner chambers), PARIETAL (see further below), and A QUATT’ROCCHI (an Italian tete-a-tete and a gift of a word for this puzzle). Three clues (B1, 11 and 13) are directly suggestive of the story, and several others are related to alcohol or drinking (3, 7, 22, 32 and 33). With these various self-imposed constraints, I now had to go through the (somewhat painful) process of setting my thematic words and otherwise filling in the gaps. I was ever mindful of providing ample checking and avoiding any possibility of an ambiguous solution. (I don’t remember the exact number, but after completing the grid and taking into account the title, quotations, etc., there are remarkably few unchecked cells.) I tackled the grid in clusters – ROQUELAURE/A QUATT’ROCCHI had to be built around each other, as did IMMURE/GUMSHOE and CRYPT/PYRETHRUM. Navigating the central barred-off cells was particularly tricky. In order to meet word length and space constraints, I needed to maximize the “work” that each clue and entry could provide; words like COAL-PORTER, MOONSCAPES, PYRETHRUM and ODALIQUE were particularly useful. I appreciate the comments of certain solvers who found the method of entry to be a bit of a slog; I am not sure that I could reasonably have expected otherwise, given the occasional tedium of setting the puzzle. The dots (which were not my original idea) were meant to be helpful. My ultimate goal was to prompt interested solvers to (re)visit the original work and, in so doing, perhaps recognize and enjoy some of the “Easter eggs” scattered throughout the puzzle and clues. Based on the solvers’ blogs and other internet feedback, it appears that several solvers took the journey and found the results not too unpleasant, which pleases me immensely and for which I am grateful.